Tags: Gold, Kameez, Straight Trouser, Thread Embroidery, White. Top: Off white crepe silk embroidered suit has lining inside. 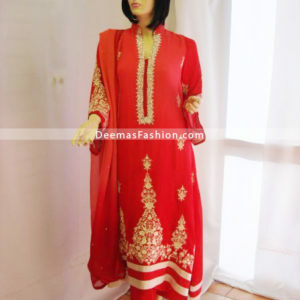 Embroidery includes bead and tilla work on neckline, sleeves and slits. Sequin sprayed all over front. Bottom/Shalwar: Katan silk straight golden trouser has slits. dupata. Katan silk straight golden trouser has slits.